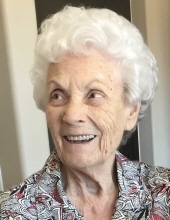 Bobbie Daphine Coapland, age 91 of Breckenridge, passed from this life on Wednesday, January 23, 2019. Family has invited you to attend her celebration of life on Saturday, January 26, at 11am at the Breckenridge Cemetery. Arrangements are under the direction of Melton-Kitchens Funeral Home. Bobbie Daphine Coapland, was born November 9, 1927 in Clarendon, Texas to Dudley and Eppie Sims. She married Bernis Ray Coapland on February 2, 1946 in Breckenridge. Bobbie worked many years for Dr. TC Ford, as a nurse and later as a secretary for Faulk Drilling. One her fondest loves was her family, and especially her grandchildren. The family was her main focus till the very end. She is preceded in death by her husband, parents, brother, Pruitt Sims, and her daughter, Saundra Lois Coapland Dixon. Mrs. Coapland is survived by her two sons, Glynn and wife, Christie Coapland of Breckenridge, Dudley Roy and wife, Cindy Coapland of Amarillo; six grandchildren, Jason Dixon and wife, Andrea, Brent Coapland and wife, Breanne, Brad Coapland and wife, Ambra, Aimee Robinson and husband, JD, Brett Coapland and wife, Kaci and Clint Coapland and wife, Tye and 14 great grandchildren. "Email Address" would like to share the life celebration of Bobbie D. Coapland. Click on the "link" to go to share a favorite memory or leave a condolence message for the family.